Late afternoon visit to meet up (late) for a group Micropub bash. Since last visit a dartboard has been added here and some longer opening hours. Good chat with a Whitstable Brewery worker / rep about the mysteries of KeyKeg from which I concluded very few KeyKeg beers are ever real ale. I arrived soon after 4pm for the pub's 4pm opening only to find that they now open at 2pm. Update sent to What Pub. A good friendly pub in the micropub style. Lancaster - Amber 3.60 A fresh cask on. First customer at early doors. Ramsgate Brewery (Gadds') - No. 7 3.80 Delicious pale bitter with just the right bitternes, just slightly less malt than usual? Traditional bitter at its best. Early evening visit. Sheerness needs a real ale and cider outlet like this enormously. Well done to the owners for fulfilling its quirky name with matching artefacts. Newly opened Micropub on the Isle Of Sheppey. 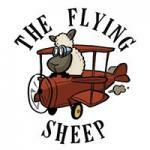 “The Flying Sheep” inherits it’s name from the history of Sheppey’s aviation past and the fact that the “Island Of Sheep” was full of erm!! Sheep. The premises, a former beauty salon, is still in the same ownership but now Sheppey’s 3rd and soon to be 4th Micropub. Decor reflects the links to Sheppey’s aviation history with parts of aircraft adorning the walls and genuine aircraft seats plus the odd sheep here and there. Ramsgate Brewery (Gadds') - No. 7 3.80 Just about as good as it gets, stunning. Stag - Red Imperial 4.50 Lacking condition. The pub is found in Sheerness, Kent, ME12 1UJ. In Sheerness's High Street a shop conversion, from a beauty salon, Micropub which opened on 24th August 2018. Real ales dispensed through 4 handpumps on the bar counter and ciders/perries on gravity dispense from the temperature controlled cellar room. Aeroplane and sheep artefacts abound, reminding of Sheppey's history. Unisex toilet. We have visited this pub 6 times, seen 15 different beers and tried 10 of them.